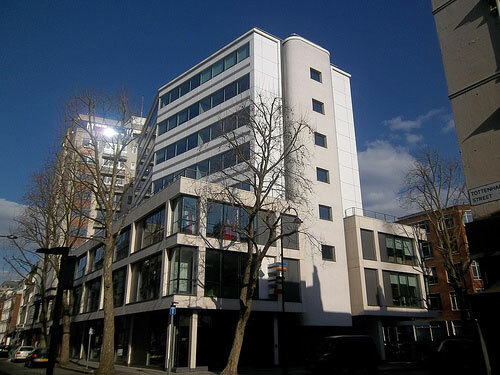 The 60 Charlotte Street project in west London consisted of the refurbishment of the existing reinforced concrete framed two-storey podium block and seven-storey tower block. The main contract works involved a full strip out of the existing finishes and plant, construction of additional floors at podium and roof levels, structural alterations to the building, new cladding and glazing, roofing, M & E works and finally fitting out. Consideration was given to the use of composites; however, this method was proven not to be appropriate in this situation. In order to progress early procurement of the steelwork we removed the existing finishes to establish the structural dimensions. Then whilst our sub-contractor detailed and fabricated the steelwork we carried out repairs to redundant service holes, structural investigation sampling and demolished areas were carried out using polymer modified mortars and a flowable micro concrete. The need for new steelwork was twofold. Firstly slabs were strengthened and dry packed with shrink compensating grout prior to removal of walls and upstands by Galliford Try. This in turn allowed them to proceed with the extension to the podium block and demolition of walls and slab edge upstands. Secondly new risers were required for the full height of the tower. Prior to cutting the holes new trimmer steel was erected and subsequently dry packed. We employed scaffolding and diamond drilling subcontractors for crash decks and for forming the holes. Cut edges to the slab were repaired using a polymer-modified mortar. Over 40 tonnes of steelwork were erected with 25 tonnes of grout, concrete and mortar used over a 20-week programme.